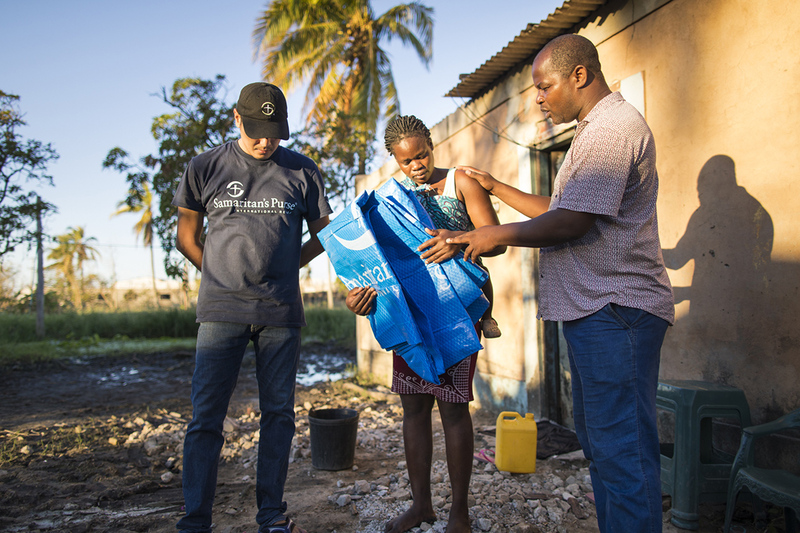 Samaritan's Purse is distributing vital relief supplies in Mozambique in the wake of the devastation of tropical Cyclone Idai. Cyclone Idai made landfall in the southern African nation of Mozambique on 14th March with more than 100mph winds. Preceded by heavy rains, the storm left 602 people dead and more than 400,000 displaced. More than 1,5 million people have been affected, with over 111,000 homes destroyed, and more damaged. It may be the worst weather-related disaster to ever strike the Southern Hemisphere, according to United Nations officials. Map showing the path of Tropical Cyclone Idai. AIRLIFT #1 (22nd March): Our DC-8 cargo plane airlifted 27 tonnes of shelter tarpaulin, mosquito nets, water filters and medical equipment. Also on-board was a team of disaster response specialists, including medical personnel, to serve the people of Mozambique in Jesus’ Name. Distribution of this cargo is already underway. AIRLIFT #2 (27th March): The DC-8 returned to the U.S. and restocked with shelter tarpaulin, large community water filters (capable of supplying 5,000 people with clean drinking water per day) and our Tier 1 Emergency Field Hospital. It arrived in southern Africa on 27th March. Our emergency field hospital opened on 4 April, and has already provided medical care for more than 900 sick and injured people, and our small surgical team have even performed several C-sections, helping mothers have safe deliveries in a disaster zone. Working primarily through local churches, our staff have helped distribute more than 7,600 tarps to families who had no shelter from the elements. Our Water, Sanitation, and Hygiene (WASH) teams have rehabilitated more than 70 wells contaminated by floodwaters—providing access to clean water again while mitigating the spread of cholera. We are also preparing 5,000 hygiene kits to distribute to people in need. 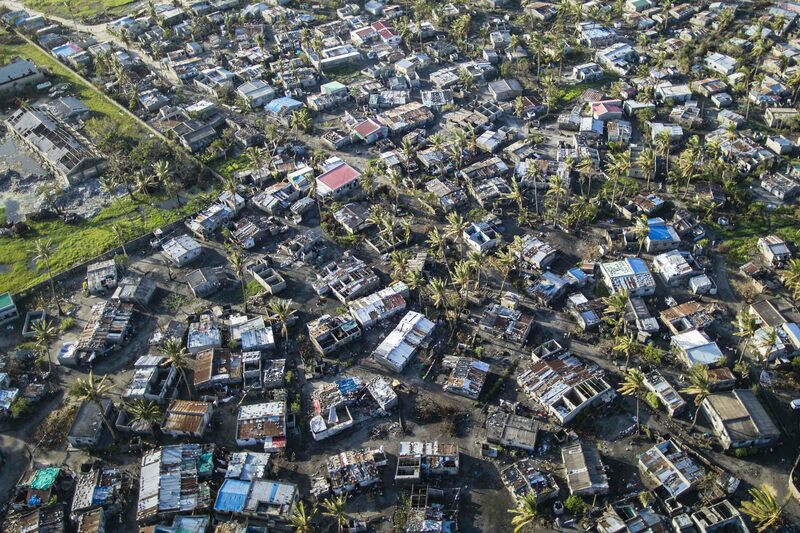 Mozambique’s port city of Beira, which serves other parts of the continent, is almost completely destroyed. Flooding has cut off major roadways, restricting access and slowing recovery efforts. 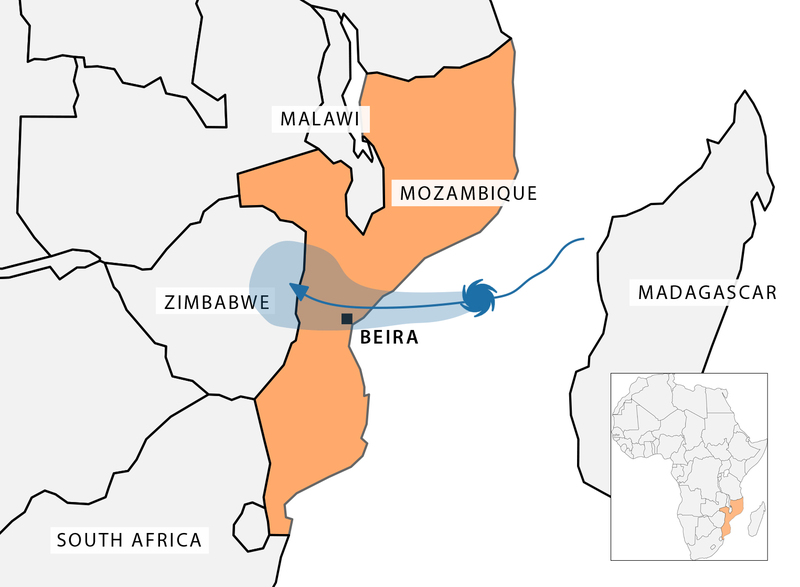 The Beira-Chimio corridor, the major trucking and supply route for neighbouring landlocked countries, is experiencing extensive flooding in which road access, electricity and communications have been cut off. 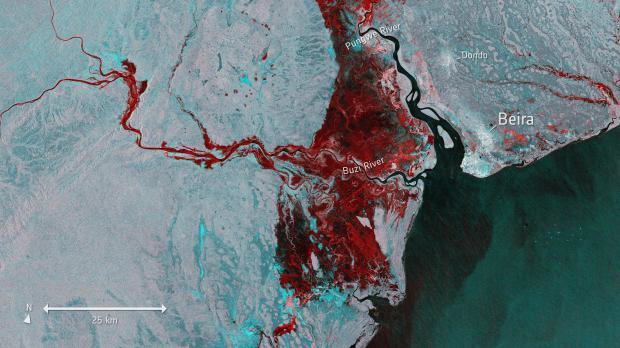 Satellite image from European Space Agency of flooding in Mozambique. Extensive damage to schools and health facilities have been reported. Continual rain in Mozambique has forced multiple dams in the region to be opened to release high waters, causing additional flooding and distress in the low-lying river basin areas. In a desperate situation of humanitarian need, the government of Mozambique officially requested international assistance.  Samaritan’s Purse were able to respond quickly, with an initial disaster response team arriving in Mozambique on Saturday 23 March. Lydia looks up to where her roof used to be, but is thankful to God for helping her start again. 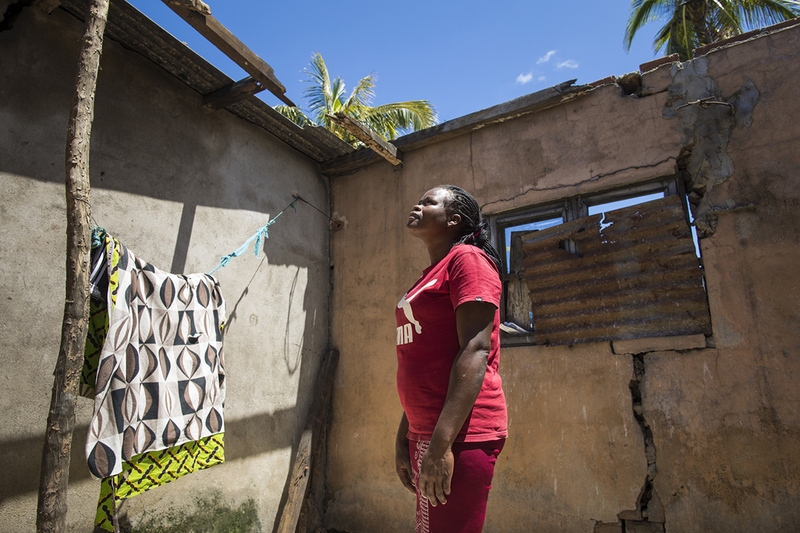 Lydia, her husband, and their two children aged 7 and 23 months lost their roof to Cyclone Idai. They were among the first families to receive heavy-duty shelter plastic from Samaritan’s Purse. Maria, a mother of four, also received a tarp from our international disaster relief team after losing her roof to the storm. She had heard about the Cyclone on the radio but had not expected such destruction. As she rode out the storm with her family, and their home crumbled around them, she was terrified. Samaritan’s Purse staff members pray with local residents as we distribute shelter materials to flooded communities. Since arriving in the region, Samaritan’s Purse has increased the scope of the response in accordance with the needs of the people. So far, we have distributed more than 7,600 tarps and treated hundreds of medical patients. Please pray for the people of Mozambique as they recover from this tragedy and for Samaritan’s Purse teams as we serve them in Jesus’ Name. The devastation from Cyclone Idai pictured above.